When we think about pyramids, the first picture we get in our mind is Egyptian pyramids. But do you know Egypt is not the only place in African continent, which have beautiful pyramids? 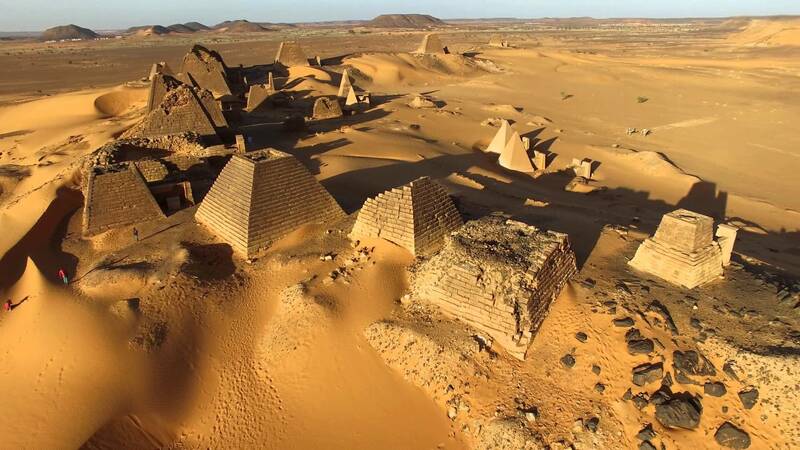 This war torn country called Sudan located almost in middle of Africa, also have amazing pyramids which are at least 3,000 years old and untouched from very long time. This is first time the National Geographic guys took their drone’s to film these Sudanese pyramids from sky and final video is just badass awesome. More than 200km from the Sudanese capital Khartoum, the remains of an ancient city rise from the arid and inhospitable terrain like a science-fiction film set. Nestled between sand dunes, the secluded pyramids seem to have been forgotten by the modern world, with no nearby restaurants or hotels to cater to tourists. The Nubian Meroe pyramids, much smaller but just as impressive as the more famous Egyptian ones, are found on the east bank of the Nile river, near a group of villages called Bagrawiyah. The pyramids get their name from the ancient city of Meroe, the capital of the Kingdom of Kush, an ancient African kingdom situated in what is now the Republic of Sudan. Around 1000 BCE, after the fall of the 24th Egyptian dynasty, the Nubian Kingdom of Kush arose as the leading power in the middle Nile region. The Kushite kings took over and ruled much of Egypt from 712 to 657 BCE. In 300 BCE, when the capital and royal burial ground of the kingdom moved to the Meroe region, the pharaonic tradition of building pyramids to encapsulate the tombs of rulers continued here. Royal pyramids were built in Nubia approximately 800 years after the Egyptians stopped building their pyramids. More than 50 ancient pyramids and royal tombs rise out of the desert sands at Meroe. The Nubian Meroe pyramids are the best preserved of the more than 220 pyramids in Sudan. They are the burial sites for more than 40 Nubian kings and queens of the Kush kingdom. Through the years, the pyramids have been plundered of all their wealth and left to the elements. Excavations began only in the mid-19th century. The Italian explorer Giuseppe Ferlini smashed the tops off 40 pyramids in a quest to find their treasure between 1800 and 1870. What the Italian explorer found was brought back to British and German museums, along with samples of Meroitic writing and reliefs depicting historical events. A few of the smaller pyramids have since been restored, looking new in comparison to their more battered neighbours. The lack of facilities and the relatively long distance from the capital Khartoum partly explain why the area sees very few visitors. Abdullah is from Al Tarabil village, a few kilometres from the ancient burial site. ‘This is our history. Here our ancestors are buried. We pay no tax for working here, but there aren’t too many people coming to visit lately,’ he said. In a good day he makes $10 to $16 offering tourists camel rides. A visitor’s permit, which costs $10, is required to visit the pyramids. The permit can be obtained in Khartoum from the Antiquities Service. New efforts are underway to preserve the pyramids from the elements and damage caused by human activity.